COLORADO SPRINGS, Colorado. (December 8, 2016) - The Space Foundation today commented on the death of Col. John H. Glenn, Jr., USMC (Ret. ), 95, the last of the Mercury Seven astronauts, military test pilots selected by NASA in 1959 to become America's first astronauts. "U.S. success in space was built on the courage and determination of men like John Glenn, who dedicated his life to serving his country and proving what humans could accomplish in space," said Kevin Cook, Space Foundation - Vice President, Marketing & Communications. In 1962, Glenn was the first American to orbit the Earth, and the fifth human in space. He was also the oldest person to go into space when, in 1998 at the age of 77, he returned to space as a Payload Specialist on Discovery's STS-95 mission. An Ohio native, Glenn was a U.S. Marine Corps aviator, engineer and United States Senator. He was inducted into the U.S. Astronaut Hall of Fame in 1990. Satnews Comments: Godspeed, and thank you, Astronaut Glenn. 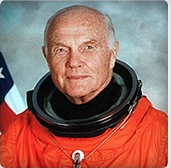 It is with great sadness and profound gratitude that the Coalition for Deep Space Exploration notes the passing of Colonel, US Marine Corps (ret), former NASA Astronaut, and former Senator (D-OH) John Herschel Glenn, Jr.
John Glenn personified the ethos of human space exploration. From when he became the first American to orbit the earth in 1962 during the Mercury program, to serving as a payload specialist aboard the Shuttle Discovery in 1998 – earning him the title of the oldest man to go into space – Glenn continuously pushed the boundaries of human spaceflight. His spirit and hard work helped set the stage for not only the Apollo and Shuttle programs, but also for the deep space human exploration effort NASA and partners are pursuing today. Glenn began his career as a naval aviator in World War II, served in the Korean War and then became a test pilot before being chosen as a Mercury astronaut. After making history at NASA, he then served as Senator from Ohio for nearly 25 years. In the last few decades, Glenn devoted his time to his local community, working with students at Ohio State University, where the John Glenn College of Public Affairs bears his name. In recognition of his extraordinary service to our country, Glenn was awarded the Congressional Gold Medal and Presidential Medal of Freedom. "Reflecting upon John Glenn’s life, we know that we have lost one of our greatest pioneers, one of our greatest public servants, and one of the greatest Americans of his generation,” said Dr. Mary Lynne Dittmar, Executive Director of the Coalition. "We can, however, take solace in the fact that his service and example has inspired and continues to inspire the boys and girls of today’s ‘Mars Generation’ to reach for the stars and push the boundary of what is possible. For this, and for his many other contributions to the nation, we will be forever grateful. On behalf of the Coalition for Deep Space Exploration, I offer our most sincere condolences to John Glenn’s family and pray that his spirit of exploration will enable him to continue to soar ever upward, as an inspiration to us all. Godspeed John Glenn."